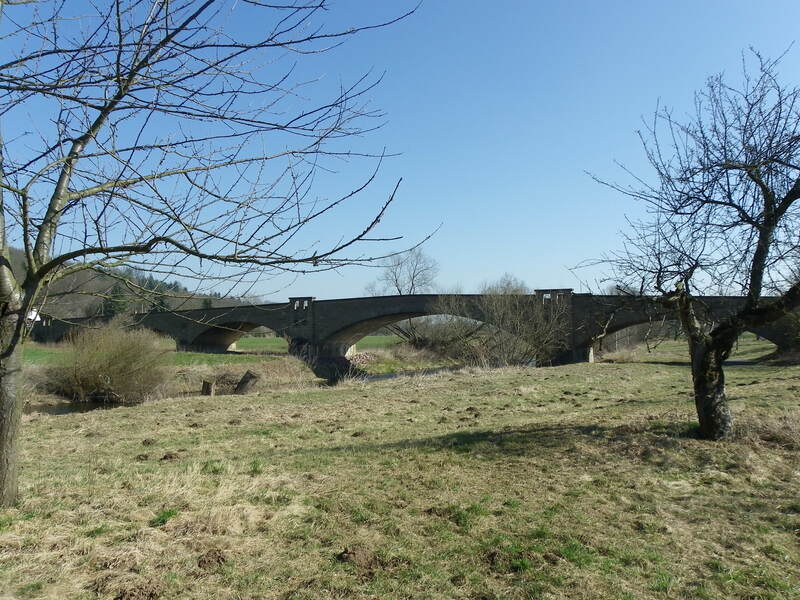 The first part of the tour looks at the bridges outside the inner part of the state capital of Thuringia. To specify on what is meant by the outskirts of Erfurt, one has to take a look at the map of Erfurt and the streams that flow through the city. The city got its name from its location on the ford of the Gera River, which is divided into three parts: the Bergstrom, the Walkstrom and the Wild Gera. As the city was prone to flooding, the city in 1890 passed a resolution, calling for the re-channeling of the Wild Gera to the south and east of the city center. The project took eight years and the Wild Gera was filled in to a point where today, the Yuri Gagarin Ring, the inner ring encircling the city center, occupies what was the river. 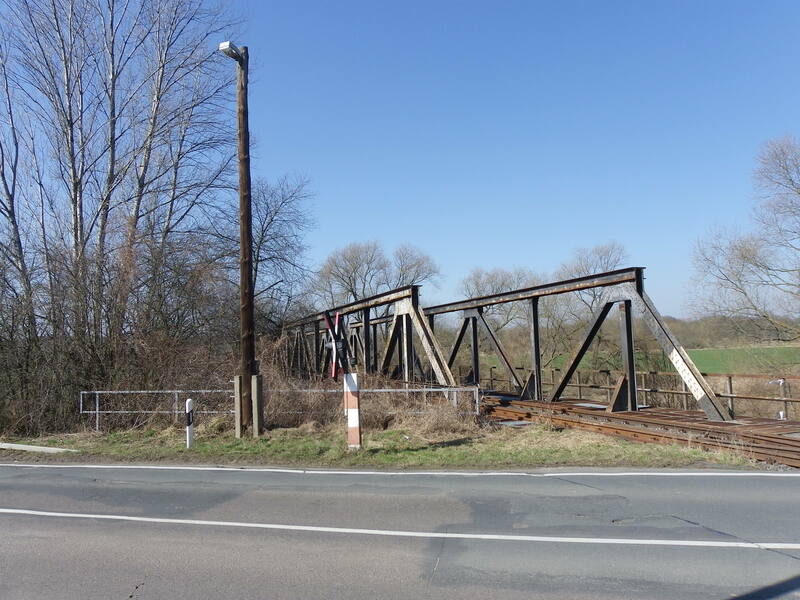 The historic bridges featured in this column will focus on the southern end of the new channel, called Flutgraben just south of the main rail lines that enter Erfurt Main Station. 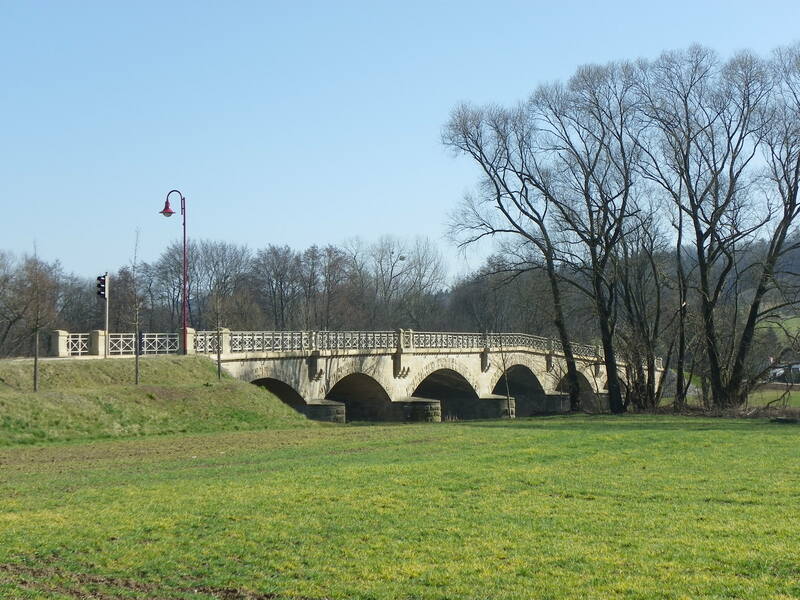 Furthermore bridges to the south and west of Erfurt, including the ones at Luisenpark as well as four located north and east of Erfurt will be featured. A map with the specific locations of the bridge appears with the first bridge profile so you have an idea where they are located. You’ll find the pictures when clicking on the highlighted words, including those on Instagram. One has to keep in mind that the bridges in Erfurt that are featured in the next three columns are the ones that are at least 100 years old, most of them being arch bridges made of concrete, brick, and/or stone. A couple exceptions are mentioned. Location: Flutgraben east of Erfurt Main Station at the intersection of the Outer Ring and Thaelmannstrasse. Type: Three-span arch bridge (rail span) and three beam spans: one for vehicular traffic and two for pedestrians. One of the spans can be viewed here. Built: 1972 for vehicular bridge replacing an arch bridge built in 1895; 1895 for rail bridge- partially replaced in 2010. 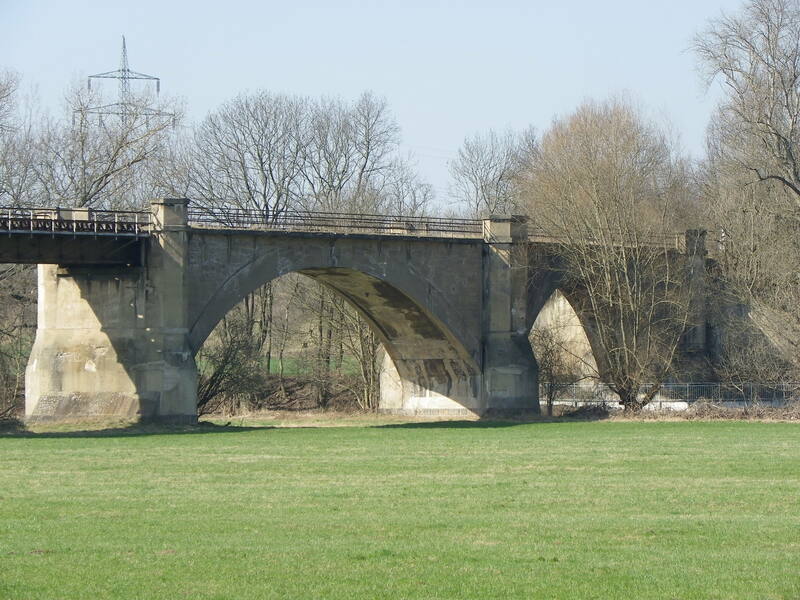 The original Schmiedstedt Bridges were one of the first structures built over the new channel of the Gera River. 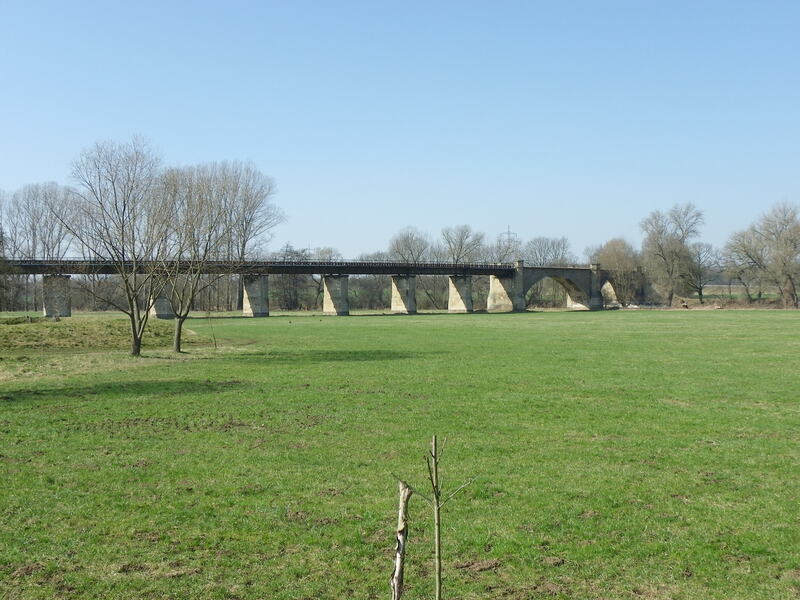 The railroad bridge consisted of three spans of a closed spandrel arch design made of quarry rock and served the rail line connecting Leipzig and points to the south and west. The roadway bridge served as a key link between the train station and what is today a technical university to the north. Yet during the 1970s, the increase in traffic volume warranted the reconstruction of the key intersection. 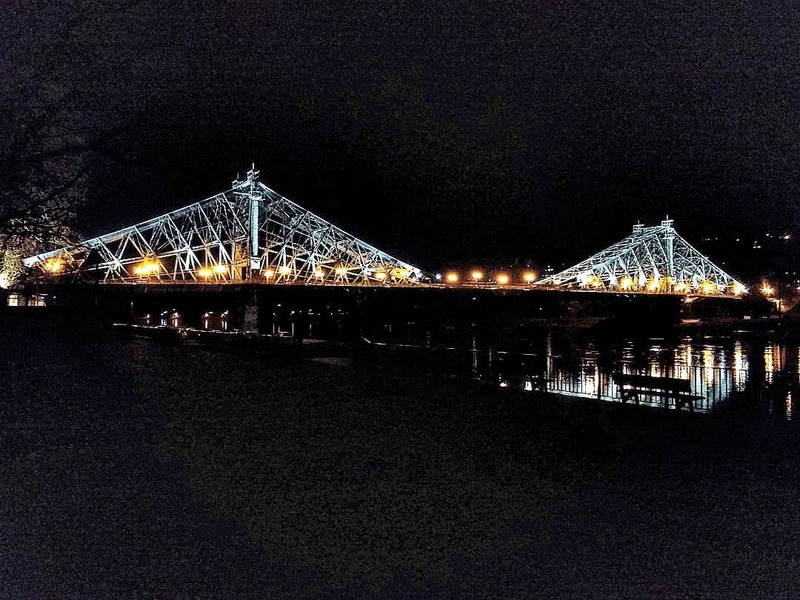 Therefore, the roadway bridge was replaced with a beam bridge with two additional pedestrian bridges being erected to the south of the bridge- one to cross the river and the main highway and one for the river enroute to the railroad bridge. As part of the plan to expand the rail service, especially with regards to the new ICE-line connecting Berlin and Nuremberg via Erfurt, the southern half of the railroad bridge was replaced and expanded, while the northern half still maintains its aesthetic value to this day. This can be seen in its entirety from the pedestrian bridge crossing the bridge and the river. Located just to the south of the Main Station over the Flutgraben, the steel bowstring arch bridge was built to serve traffic going directly to the city center of Anger. The bridge lasted only 20 years at this location for a wider structure was needed to accommodate not only horse and buggy but also the street cars that went across the bridge going south and west. It was replaced by a concrete arch bridge in 1912, but the truss bridge was relocated to its present site in 1912, where it still serves traffic today but with certain weight and height restrictions. The concrete arch structure was replaced in 2004 as part of the project to renovate the train station and make the surrounding infrastructure more accessible for streetcars, buses and pedestrians alike. Built: 1897 replacing a wooden bridge built in 1875. 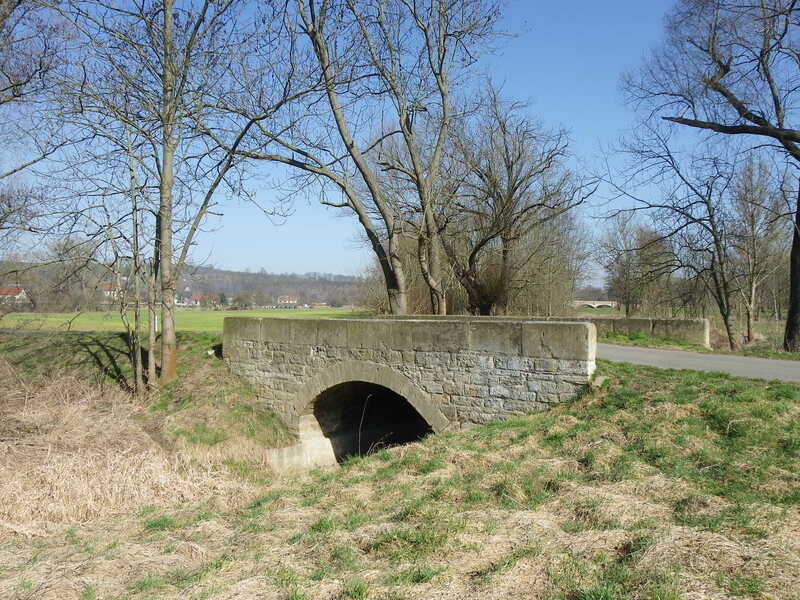 The origin of this bridge came from one of the towers that existed in the 13th century, where horse and buggy and people could enter and leave the walled city from Steigerwald Forest and Dreibrunnenfeld Field both located to the south and west of the city. The city itself was a walled fortress until the 1890s when the new channel was built replacing the Wild Gera and the gates and towers were proven to be obsolete. However, the bridge was not based on the tower, which no longer exists. It is based on the street it carries. The bridge also served street car traffic which started with horse and tram (Pferdebahn) in 1883 and was followed by the electric street car in 1894. The line, which connected the northern suburb of Illversgehofen and the southern natural area, was later made obsolete by the line passing through Erfurt Main Station. Today’s bridge is one of the most unique of the bridges serving Erfurt as well as the state of Thuringia. Built in 1897, it is characterized by four towers with vintage lanterns supported by ornamental candelabras. Built using limestone, sandstone and chalk, the outer features are covered by ornamental shields found on each end of the span, while its balustrades resemble a typical arch or concrete beam bridge built in the 1900s in the USA. 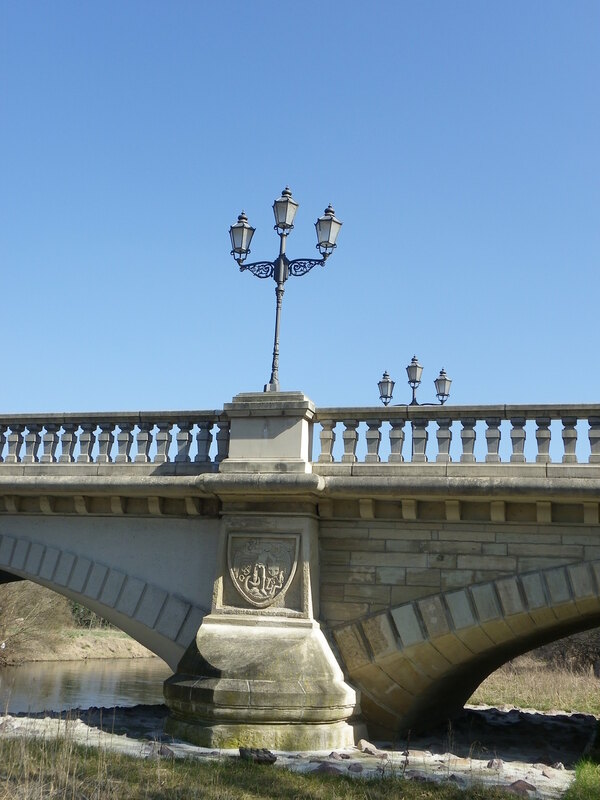 The year it was built can be found on the outer end of the bridge in the middle of the balustrade. 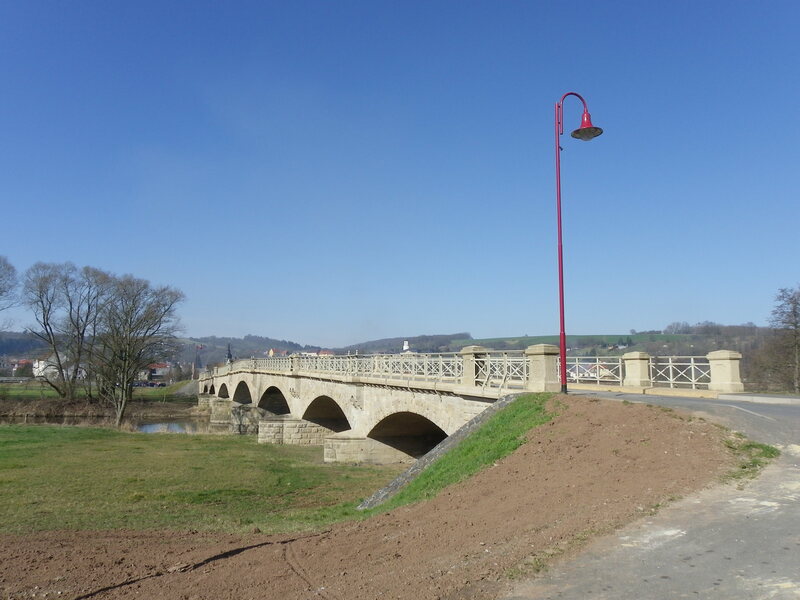 The bridge was renovated twice: in 1988 when the towers, obelisks, and candelabras were carefully renovated, and in 1997/8 when the bridge itself was reinforced to support more traffic with the shield and other ornamental features being redone. Today the bridge serves the two main highways passing through Erfurt: B7 which is a east-west route connecting Weimar, Jena and Eisenach and B4, a north-south route connecting Nordhausen and Suhl. It still retains its beauty after a pair of cosmetic operations and is a must see while visiting the city, no matter what time of day it is. Links: Oblique view, View of the Lantern, Side View. In order to provide better access to the Dreierbrunnenpark (now the present-day Luisenpark), the city of Erfurt let the contract out to a firm in Leipzig called Alban Vetterlein and Company, whose branch office was located in Erfurt in May 1911. Construction took almost two years as the city wanted to make the bridge an attractive piece of artwork that was part of the city park. Henceforth, they hired Carl Mellville (1875-1957), a teacher of the school of art, to construct four different sculptures on each corner of the bridge, two per gender and each representing a different form of artwork. The bridge still retains its structural and aesthetic integrity today, even though renovations had to be made to the structure in 1992 to make it more structurally sound and keep the sculptures from eroding due to weather extremities and air pollution caused by the industry during the Cold War period which was being shut down after German reunification. There are two characteristics that make these bridges special. Both of them are the only arch bridges of its type serving the city. And both of them serve pedestrians and cyclists. Both were constructed using sandstone and lime thus resembling a tan-colored appearance. 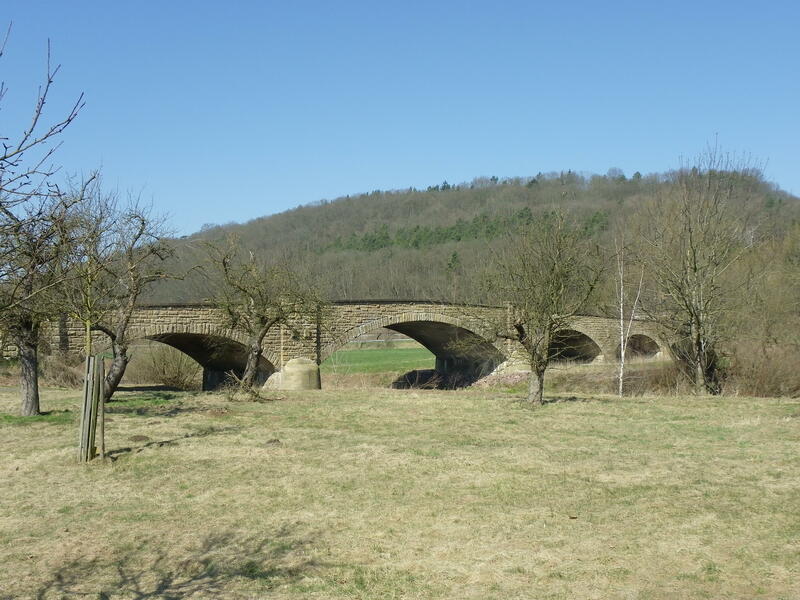 The difference between the two are that the roadway is curved in the Wilhelmsteg, whereas in the Friedrichsteg, the roadway is bent upwards in a slant, making a point at the center of the span. 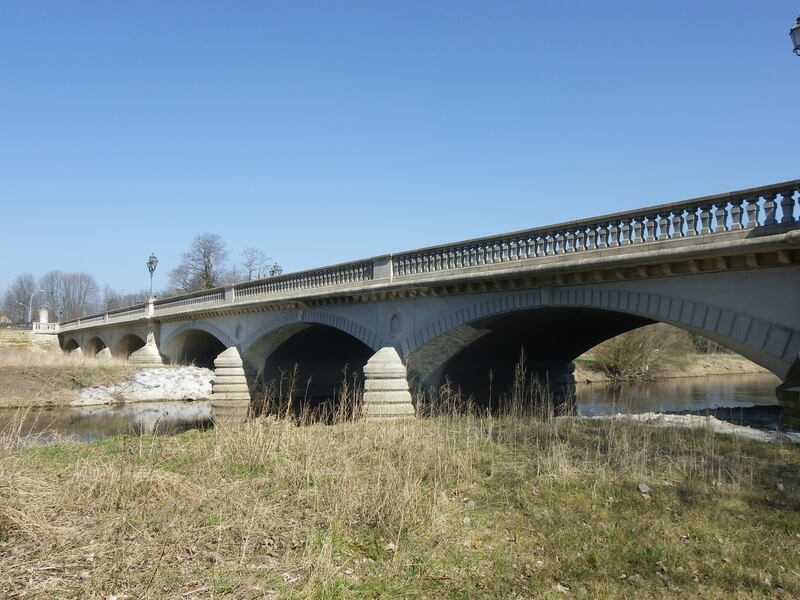 Furthermore, unlike the Wilhelmsteg, the Friedrichsteg is one of only a handful of arch bridges that has both an open and closed spandrel design. The Wilhelmsteg is an open spandrel arch. While the Wilhelmsteg was renovated in 2002, the Friedrichsteg still retains its original appearance although renovation will most likely happen in a few years. Both serve the Gera Bike Trail leading to Luisenpark and all points to the south and west. To provide protection for the city against floods from the Gera River, a series of dams and locks were built in the 1600s to control the flow of water going through the inner part of the city. 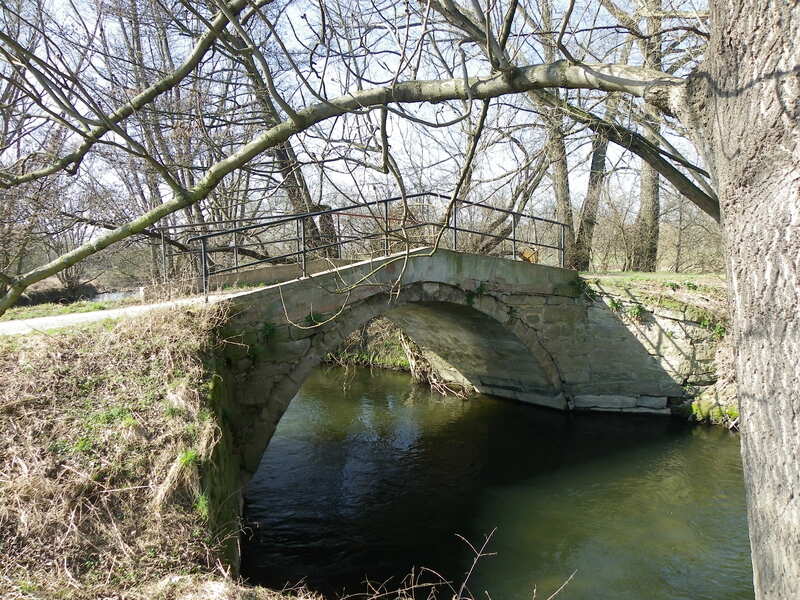 This was one of them, a contraption featuring a stone arch bridge for people to use that also functions as a dam that was originally located outside the outermost walls of Erfurt. It only functioned partially as problems with water being dammed up causing flooding upstream in areas where the Luisenpark is now located prompted a more permanent solution in the 1890s, which was re-channeling the river. In 1899 an electric street car line was established on the bridge, only to be removed 60 years later. 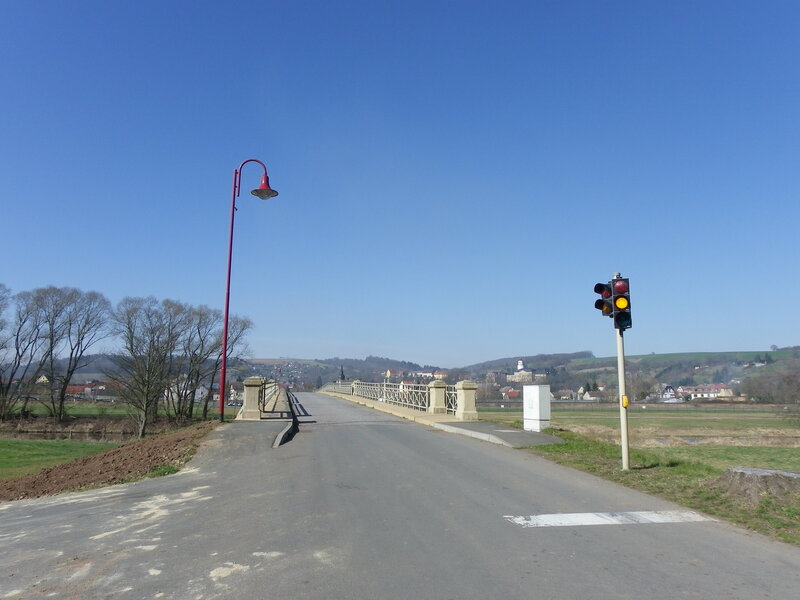 The bridge today still serves traffic while at the same time, functions as a dam even though the is not much river flow through the city thanks to the Flutgraben that now encircles the city center. As many as seven bridges cross the Gera River and the tributaries of the Bergstrom and Walkstrom Creeks. Yet two of them stand out as ones that are worth seeing. We have the covered bridge known as the Hospitalsteg, a pedestrian crossing that used to cross the Wild Gera before the river was rechanneled. It was built using a queenpost truss design but after the Wild Gera was filled in, the bridge was shortened in length and relocated to this site, where it still serves pedestrians today. Then there is a cable-stayed suspension bridge, located to the east of the covered bridge spanning the Flutgraben. 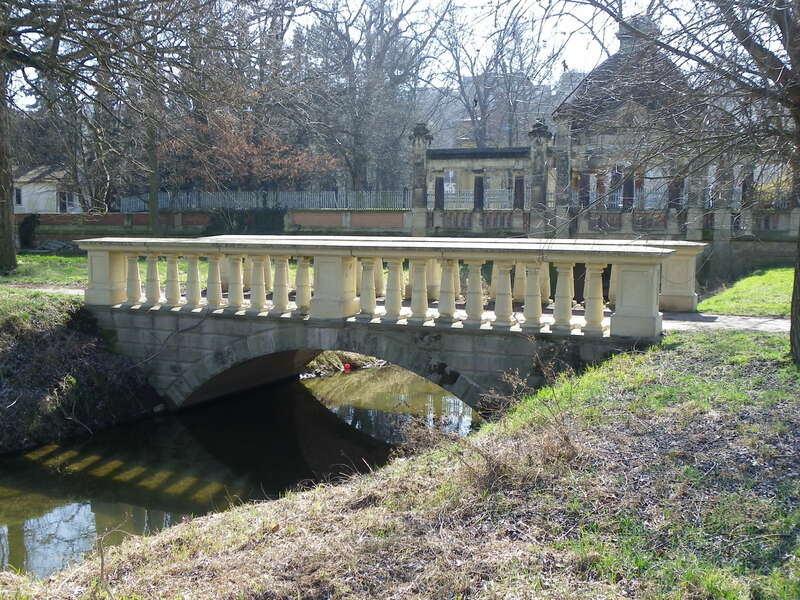 The bridge was probably built after German Reunification and still retains its structural integrity today as it provides access for pedestrians and cyclists to the Brühl Garden located north of the park. Contrary to the majority of today’s cable-stayed bridges in the US, this one fits nicely into the landscape. The name Geschwister Scholl can be found throughout all of Germany, as every town has a street named in memory of the siblings Sophie and Hans Scholl, who were part of the White Rose movement against the regime of Adolf Hitler but were executed by order of the People’s Court on 18 February, 1943. The railroad overpass carries this street but is structurally unique because it features one large center arch span and two smaller ones located along the slopes. The bridge is very difficult to find as many objects are in the way, creating an impression that it is just an ordinary bridge. However, another bridge, a deck Queenpost truss bridge is located next to the arch bridge- another rarity in the world of bridge architecture. The bridges cross a rail line connecting Erfurt Main Station with cities in the north, including Nordhausen, Sangerhausen and Magdeburg. Location: The Erfurt-Magdeburg, Erfurt-Nordhausen and Erfurt-Kassel Rail Lines over Leipziger Strasse between the city limits and Ringelberg. Although not featured in the books by Baumbach and Vockrodt, the three bridges are a diamond in the rough in terms of its features and appearance. 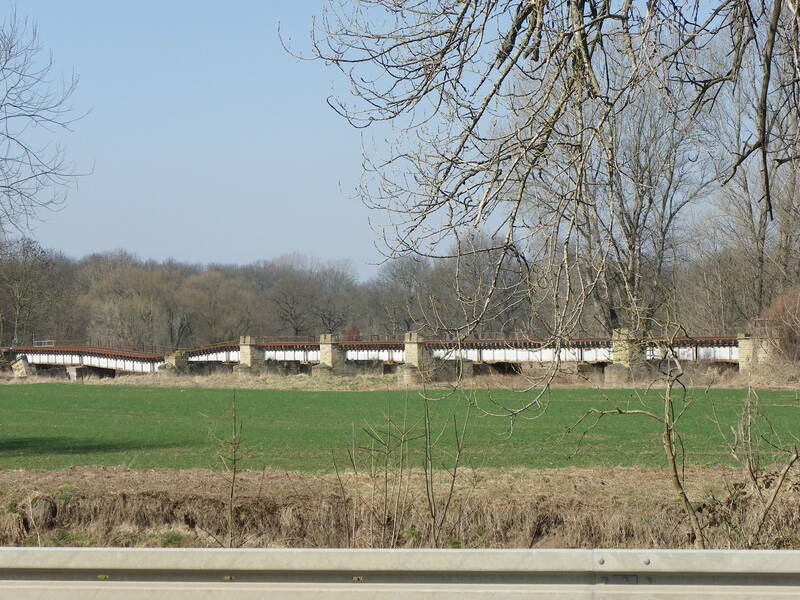 The bridges were built between 1919 and 1926, and given their appearance, the bridges aged much more rapidly than expected, thus prompting the Deutsche Bahn (German Railways) to replace both bridges in 2016-17. This was deemed a necessity as the railways plan to increase passenger train service to the north of Thuringia and beyond. 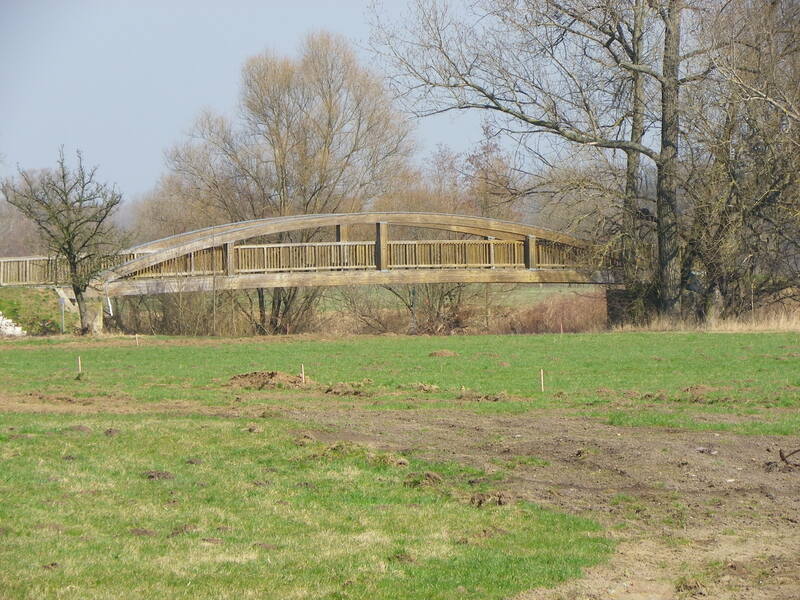 This bridge is located in the southwestern most part of the greater Erfurt area near the suburb of Erfurt.Bischleben. Its aesthetics is very uncharacteristic of any arch bridge in Erfurt. Built in 1752 by Gustav Adolf von Goetter, the bridge was originally featured one stone arch span. However, to better improve the flow of the creek, an additional arch was added in 1896, albeit it is only two-thirds of the original arch span. The arch bridge is also curved, making it one of two bridges in Erfurt, whose structure does not cross a ravine in a straight line. Although the structure was made obsolete by a new beam structure in 1965, the German Democratic Republic declared the bridge a historic monument, although it was not renovated until 1995. The latest changes feature pavement replacing cobblestones in 2010. Other than that, the bridge and the tower that is next to it still maintains its structural integrity. It can be seen from the railway west of Erfurt. 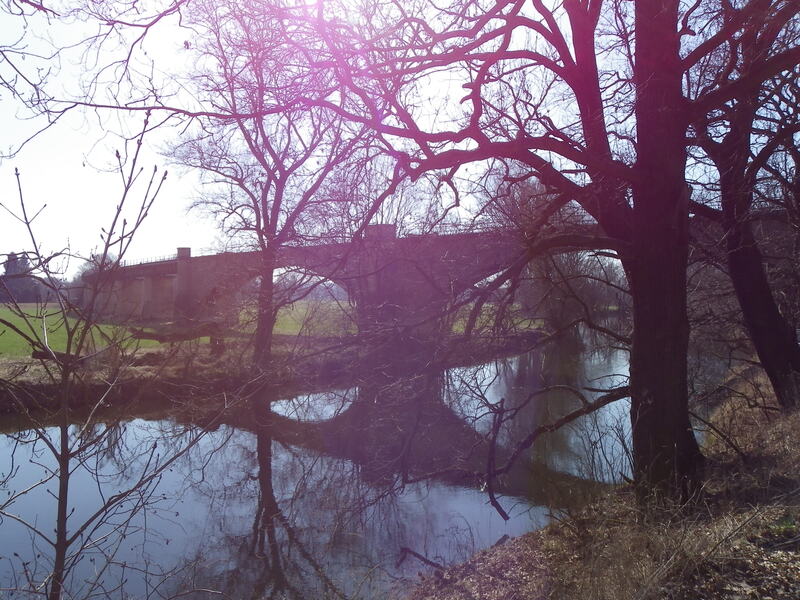 This bridge is one of only a couple of its kind that still exists in Erfurt. It used to serve a passenger rail line that passed through Rieth before making its way northwest. Yet with the German Reunification in 1990 combined with the plan to use a line east of the bridge for passenger service (the Erfurt-Kassel Line), the line and the bridge was both abandoned. They still exist today and the bridge can be seen from the main highway. 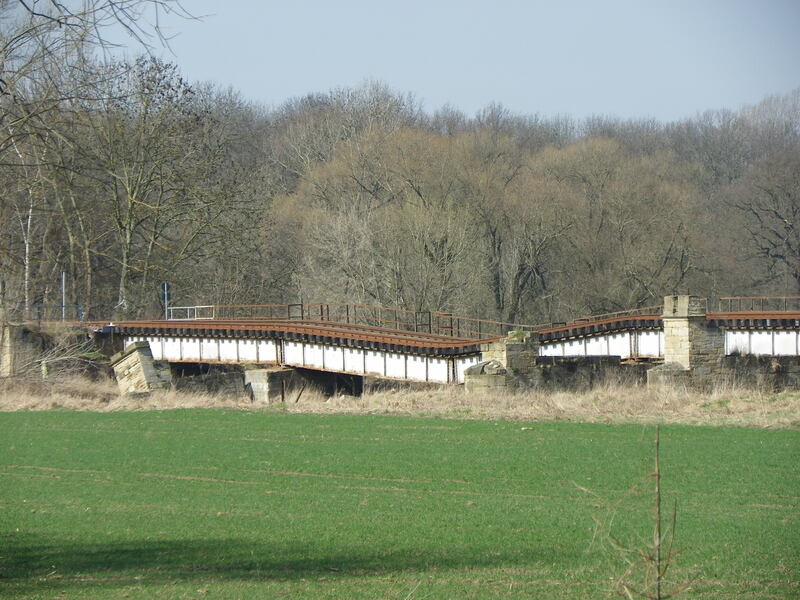 Interesting enough, another bridge similar to this one, serves the Erfurt-Kassel Line spanning the Gera near Kuehnhausen, one of the northernmost suburbs of the greater Erfurt area. 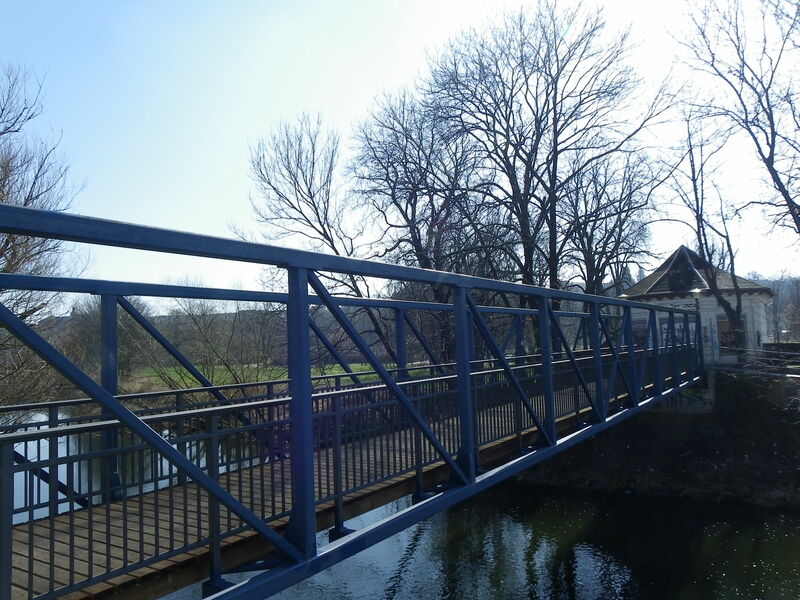 This bridge is the newest of the structures in Erfurt, yet it is the second bridge of its kind in Erfirt. 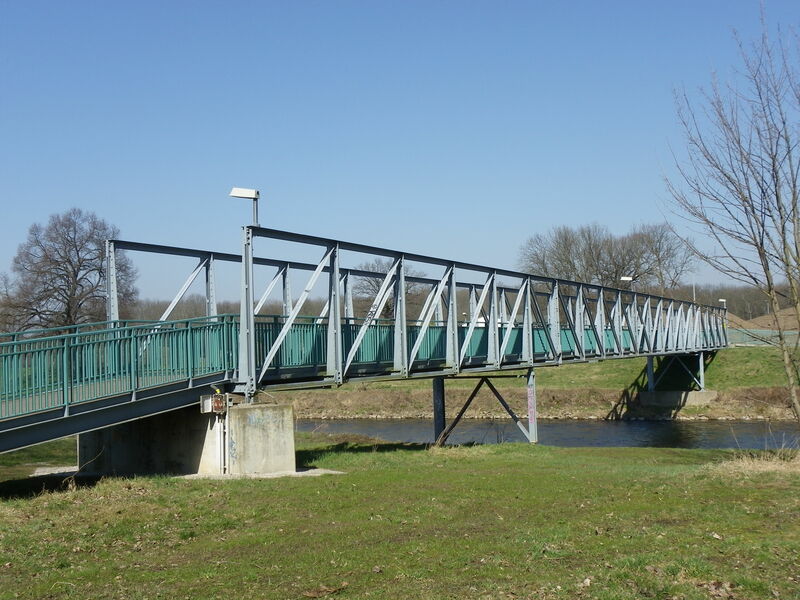 The bridge was built to replace a deck girder bridge that had been built by a firm in Weiden (Bavaria) in the 1990s but was used for pedestrians. The western entrance featured wooden stairways going down to the structure. The new bridge eliminated that while at the same time, provides another possibility for cyclists and pedestrians going to Nordpark and the hospital complex from the eastern part of the city. The next segment will feature the bridges in the innermost part of the city and with that, also the Karlsbrücke, located between the city center and the Riethstrasse-Brücke in the northern part of the city.